I once believed that Israel has never defined its borders. It was one of those things that “everyone knows”. I was corrected by the blogger talknic. Mondoweiss is privileged to have talknic as a frequent commenter, and many readers here will be familiar with the document to which he pointed me: the letter written by Eliahu Epstein, the representative of the Jewish Agency in Washington, to President Truman and to the State Department, on May 14, 1948. My dear Mr. President, I have the honor to notify you that the State of Israel has been proclaimed as an independent republic within the frontiers approved by the General Assembly of the United Nations in its Resolution of November 29, 1947. (The full text is given in the link above, and also appears below.) The resolution referred to, UNGA Resolution 181, recommended the partition of Palestine into separate Jewish and Arab states. The Zionist leadership had publicly accepted the Partition Plan, and this letter defines the borders of Israel to be those specified in the Plan (see map). As soon as I read the words “proclaimed… within the frontiers…” I knew that I had been fooled by Zionist propaganda. Reflecting further, I realized that the idea of a state without defined borders is actually completely nonsensical. Suppose there were no defined border between Canada and the USA. People would not know in which country they were living; what was their citizenship; whose laws they needed to obey; what currency they could use. It would be chaos. The Montevideo Convention lists the following requirements for the existence of a state: a permanent population; a defined territory; government, and the capacity to enter into relations with other states. If Israel had really been declared as a state without borders, it would not have been a state at all. To understand how the Zionist leadership came to make this border definition, and why later they tried, very successfully, to convince the world that it never happened, we need to consider events in both Tel Aviv and Washington as the end of the Mandate approached. Israel was reluctant to define its borders. According to an article on the Israel Government website, the Provisional Government of Israel met in Tel Aviv from May 12 to May 14 to consider the draft declaration of independence. It was led by David Ben-Gurion as Prime Minister and Defense Minister. There were heated discussions about the borders. Some said stick to the Partition Plan borders, while Ben-Gurion argued strongly that they should say nothingabout the borders, because it was his intention to capture territoryoutside the Partition Plan borders and include it in the state. His view was accepted by a vote of five to four in favor, with the four other members being absent. This vote is the origin of the story that “Israel has never defined its borders”. Ben-Gurion went home on the evening of May 13 and completely rewrote the draft declaration of independence, removing all references to the Partition Plan. His motive is clear. He wanted to create the sort of chaotic situation I outlined in my Canada-USA illustration. If there was no defined border between Israel and the rest of Palestine, then all of Palestine could be considered open territory, available for conquest. WE… BY VIRTUE OF OUR NATURAL AND HISTORIC RIGHT AND ON THE STRENGTH OF THE RESOLUTION OF THE UNITED NATIONS GENERAL ASSEMBLY, HEREBY DECLARE THE ESTABLISHMENT OF A JEWISH STATE IN ERETZ-ISRAEL, TO BE KNOWN AS THE STATE OF ISRAEL. Being based on the Partition Plan, the Declaration implicitly defines the borders to be those specified in the Plan, but does not say so explicitly. Since the declaration of a new state is a once-only event, whereas borders can be changed later, the absence of a border definition in the Declaration itself is not significant. It was Epstein’s letter that formally defined Israel’s borders. 2. Informal conversations with White House representatives have made clear that recognition de facto rather than de jure because announced government provisional in nature. My dear Mr. President: I have the honor to notify you that the State of Israel has been proclaimed as an independent republic within the frontiers approved by the General Assembly of the United Nations in its Resolution of November 29, 1947, and that the Provisional Government has been charged to assume the rights and duties of government for preserving law and order within the boundaries of Israel, for defending the state against external aggression, and for discharging the obligations of Israel to the other nations of the world in accordance with international law. The Act of Independence will become effective one minute after six o’clock on the evening of 14 May 1948 Washington time. With full knowledge of the deep bond of sympathy which has existed and has strengthened over the past thirty years between the Government of the United States and the Jewish people of Palestine, I have been authorized by the Provisional Government of the new State to tender this message and to express the hope that your government will recognize and will welcome Israel into the community of nations. Agent, Provisional Government of Israel. 4. Wider consultation and prior notifications were precluded by pledge of secrecy demanded by Clifford. 5. Earlier during the day Loy Henderson phoned to ascertain boundaries of new State. Advised that boundaries in accordance with U.N Resolution. 6. Circumstances required that I take title for this act and assume responsibility for sending letter. Clark Clifford was a strong supporter of the Zionist cause and encouraged Truman to recognize the State of Israel as soon as it was declared. In his memoirs he says that he helped Epstein compose the request for recognition, and that it was he who told Epstein “it was particularly important to claim nothing beyond the boundaries outlined in the UN Resolution”. Loy Henderson was in the State Department, and had been opposing Truman’s recognition. Now that it was going ahead, he also wanted to make sure that Israel was defining its borders. Epstein gave a more detailed account of the phone call to Max Lowenthal, another Truman adviser. Henderson had askedwhether the Jewish State wanted any territory other than was granted in the UN resolution. Epstein replied “No, and any territory taken until peace was achieved would be returned to the Arab state”. It is clear that Israel would not have been recognized by the US if it had not declared on the Partition Plan borders. The telegram suggests that Epstein was not able to communicate with the Zionist leadership in Tel Aviv before submitting his letter to Truman. Fortunately, both had made similar decisions: in Tel Aviv to base the Declaration on the Partition Plan; in Washington to define borders according to the Plan. There was no doubt in the 1948-49 period about the location of Israel’s borders. The text of Epstein’s letter, together with Truman’s response recognizing Israel, was released to the world press in Washington on May 15, 1948. Talknic’s website and my own list several occasions on which Israel publicly acknowledged the existence of these borders. All the states recognizing Israel knew the extent of the territory it was claiming. The words of the Declaration are intended to suggest that the creation of Israel was authorized by the United Nations. This is not correct. The UN does not have authority under its Charter to create or divide states. The Partition Plan was a recommendation only. The Plan envisaged a process, starting at the end of the Mandate, which would lead to the establishment of two states in a series of parallel stages. Because the Plan was rejected by the Arab side, it could not be implemented. Israel was created as a sovereign state by the decision of the Zionist leadership to preempt the process envisaged in the Plan, and to declare the State of Israel immediately on termination of the Mandate. The borders specified at that time are its sovereign borders: the borders within which Israel claimed and exercised sovereign authority and on which it was recognized by other states. It is sometimes asked whether the creation of Israel was legal. The answer is that it was neither legal nor illegal, because there is no system of law governing the creation of states. Israel exists as a sovereign state because it satisfied the requirements of the Montevideo Convention, and was recognized as such by other states. Israel’s Declaration partitioned the land into two territories: the State of Israel, and the remainder of Palestine outside the sovereign borders of Israel, corresponding to the area of the Arab state in the Partition Plan. Palestine was in a sorry state, with much of its population having become refugees, and it had no government because the Mandate had ended, and there was nothing to replace it. It became a non-self-governing territory. The Jewish National Home policy of the British Mandate had made it impossible for the Palestinians to exercise their right of self-determination in Mandatory Palestine, as confirmed by the report of the UN Special Committee on Palestine (II.176). 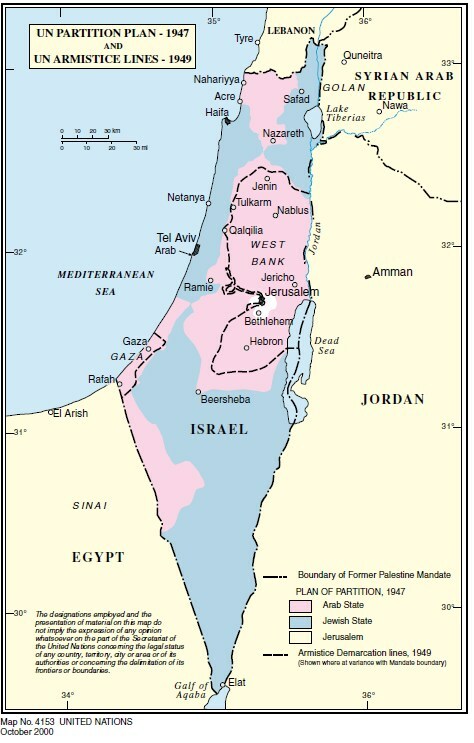 But, because Israel’s border definition limited the sovereign extent of the State of Israel to that specified for the Jewish state in the Partition Plan, it also defined the borders of the non-self-governing territory of Palestine, creating the possibility that the Palestinians could exercise that right, the right to their own state, in the territory allocated to the Arab state in the Partition Plan. Borders can be changed, but a state can only acquire territory from a neighbor by legal annexation, that is, by agreement, and with a referendum of the population. Obtaining territory by war violates fundamental principles of the UN Charter. Nevertheless, this is what Israel did. Israel was founded in the midst of civil war between Jews and Arabs. At 00:01 on May 15, 1948, when the Declaration became effective, Jewish militias were already fighting outside Israel’s sovereign borders, in the territory of Palestine. That same night, forces of the Arab states entered Palestine, and the civil war became a war between Israel and the Arab States. Knowing the location of Israel’s borders gives a better understanding of the nature of this war. Most of the fighting was in Palestine, outside the borders of Israel, and no Jordanian forces entered Israel. The Arab League told the UN that they were entering Palestine to protect Arabs from Zionist attack: Israel told the UN that its forces were operating in Palestine, outside its borders, in order to protect Jews from Arab attack. The UN did not identify either side as an aggressor. He thus confirmed both the existence of the borders, and his intention to capture territory outside them. As the war progressed Israel continued to gain territory, until the fighting stopped with the Armistices of 1949. In the captured territory between the partition lines and the armistice lines (see map above), Israel applied Israeli law, rather than a military occupation under the laws of war, making the territory in effect (de facto) part of Israel. The armistice lines (collectively the Green Line) therefore became the de facto border of Israel. Needless to say, this was not a legal annexation, as the armistice agreements themselves make clear: “the Armistice Demarcation Line is not to be construed in any sense as a political or territorial boundary”. Since Israel has no intention of returning this territory, it is rightly called stolen land. Israel’s sovereign territory amounts to some 55% of Mandatory Palestine, the stolen land another 23%, with the remaining 22% comprising the West Bank and Gaza. The stolen land includes the cities of Acre, Ashkelon, Jaffa, Nazareth, Ramle, Beersheba, Lydda, and West Jerusalem, all except the last having being allocated to the Arab state in the Partition Plan as they were major Arab population centers. Under Chapter XI of the UN Charter a “sacred trust” is automatically created when a state (in this case Israel) administers a non-self-governing territory (parts of Palestine). Under this trust the responsibility of Israel in the stolen land was to recognize that “the interests of the inhabitants of these territories are paramount” and to help them “develop self-government and free political institutions”. In other words, to help the Palestinian people achieve their right of self-determination in their own land. Israel seriously violated this sacred trust. Making the territory part of Israel preventsits people from developing free political institutions and self-government. The refusal to allow Palestinian refugees to return, the destruction of their villages, and their replacement by immigrant Jews, puts the interests of the Palestinian people below those of Jewish immigrants into Palestinian territory. Chapter XI of the Charter also applies in the West Bank and Gaza, occupied by Israel in 1967. As the administration there is military, it must also obey the Geneva Conventions. Israel has violated those as well. Nothing has changed the status of the border between Israel and Palestine since 1949, as there has been no peace treaty between the two sides. The partition line is still the declared and recognized sovereign border of Israel. The Green Line is still the de facto border of Israel. And please, everyone, stop calling it the pre-1967 border: it is not a recognized border, and it did not move an inch in 1967. Nor is the territory inside the de facto border ‘Israel proper’. The stolen land is improperly regarded as part of Israel since it was obtained by war in violation of the UN Charter. Palestine has said that, in the interests of peace, Israel can keep the land stolen in 1948-49. This is a wise decision. The stolen land is fully integrated with the rest of Israel, and this situation is irreversible. It is also a very generous offer. In fact too generous, because Palestine has not even asked for territorial compensation for the loss of much of its heartlands. This is a mistake. Israel has a population of around 8 million. The Palestinian population, including the West Bank, Gaza, and stateless refugees with a right to return, is around 9 million. A peace agreement that left only 22% of Palestine under Palestinian Arab sovereignty could not possibly be considered a viable or just solution which would lead to a lasting peace. The failure to ask for compensation arises because the Palestinian leadership believes that Israel has never defined its borders. They believe it because it is one of those things that “everyone knows”, and also because their legal adviser has told them that Israel does not have “determinate borders”. Consequently, they do not understand the legal distinction between Israel’s sovereign territory and the stolen land. The same adviser also told them that UN Security Council Resolution 242 “set forth” the boundaries of the Palestinian State. This is another nonsensical fiction. Resolution 242 says nothing about the position of any borders, nor could it, because the UN has no authority to tell a state where its borders are; that is for states to agree between themselves. I believe that Palestine can make a strong case that, in terms of justice, international law, and viability, it deserves and needs a transfer of territory from Israeli sovereignty in the southern Negev (that is, south of Beersheba, the city itself being within the stolen land). This would achieve three things: provide territorial contiguity between the West Bank and Gaza; provide space for the returning refugees; and enable the Bedouin, if they so wish, to transfer from Israeli sovereignty to Palestinian sovereignty. This is not a new idea. The Negev was allocated to the Jewish state in the Partition Plan as an area capable of absorbing large numbers of Jewish immigrants, having at the time only a small population of mostly Bedouin. The UN Mediator was the first to suggest, (see his September 1948 Progress Report [One.III.6]), that some of the Negev be transferred to the proposed Arab state, at that time as compensation for the loss of western Galilee. The Arabs, at the failed attempt at a peace conference in Lausanne in 1949 said that they would need the Negev to accommodate the returning refugees, since Israel was not willing to accept them. (See this report of the Conciliation Commission [IV.15]). During the conference President Truman wrote a secret Note to Ben-Gurion deploring Israel’s refusal to provide territorial compensation for areas it had acquired outside the Partition Plan borders. The expulsion of 750,000 non-Jewish Palestinians and Israel’s de facto enlargement in the 1948-49 war meant that the original reason for allocating the Negev to Israel had become obsolete. Although Israel has been actively developing the Negev for Jewish occupation since 2005, population density is still low. It should be possible to produce a suitable division of territory. To keep contiguous both Israeli and Palestinian territory, there could be a neutral crossing point between the two states, similar to those in the Partition Plan (see them in the attached map, to the south-west of Nazareth and of Ramle). Negotiation of new borders needs to be handled with respect to the wishes of residents. It would not be legal to transfer people from one sovereignty to another unless the majority of them agreed, and the border lines should be drawn so as to minimize the number of people who consider themselves adversely affected. For example, as far as possible Jewish settlements in the Negev should be kept within Israel. Everyone whose sovereignty is changed should be given dual citizenship. All this discussion of borders and territories would immediately become irrelevant if there were a one-state solution. I expect this will happen eventually, my own view being that the solution with the greatest chance of success would be a union of the two nations to form a single state, along the lines of the England-Scotland model. But at the moment, the two states already exist, and the only way that they can successfully become one is by a voluntary merger, federation or union. It cannot be voluntary unless the two nations negotiate on an equal basis. So, a one-state solution can only proceed by way of an intermediate two-state solution. The territorial question must be sorted out. Israel’s declaration of sovereign borders on May 14, 1948 was a deception practiced upon President Truman and the rest of the world, designed to elicit recognition of Israel. Israel never had an intention to stick to those borders. Since those days, Israel and its Zionist supporters have practiced another deception: that the border definition never happened. How did such a nonsensical and easily disproved idea become something that “everyone knows”? And “everyone” includes some surprising people: the historian Avi Shlaim, Professor at Oxford University, said in an interview that “the Armistice Lines are the only internationally recognized borders that Israel ever had”; Francis A. Boyle, Professor of International Law at the University of Illinois is the adviser to the PLO, already mentioned, who said that “Israel does not have determinate borders”; Uri Avnery, veteran Israeli journalist, politician and peace activist, has said that “from its first day, the State of Israel has refused to fix its borders”; Jeremy R. Hammond, editor of Foreign Policy Journal, in his book The Rejection of Palestinian Self Determination (Chapter IV) says, of the creation of Israel, “significantly, no borders for the newly proclaimed state were specified”; John B. Judis, political historian, in his recent book Genesis about Truman, Zionism, and the creation of Israel, discusses the events of May 14, 1948 in Washington (page 317), mentioning that Clifford worked with Epstein on the letter asking for recognition, but shows no knowledge of its content and gives no reference to the text. Provision of misleading information, such as the article about Israel’s Declaration of Independence discussed above, is one Zionist propaganda technique, but the main one is simple silence and suppression of information. I may be exaggerating somewhat by describing Epstein’s letter to Truman as “hidden”, since it has been in the public domain since May 15, 1948, but for a document of such historic significance it has a very low profile on the internet. As far as I can determine there is not a single Israel Government or Zionist website which mentions this letter when talking about the foundation of the State of Israel and Truman’s recognition. The full text appears on only three well-known websites: as an unsearchable facsimile of the original in the Truman library; the Avalon project at Yale Law School; and in the Jewish Virtual Library, where it is indexed only as a “Letter from Provisional Government to USA” and nowhere are its contents or significance discussed. Otherwise it appears mostly on blogs, news archives and discussions. Active suppression also takes place. I have sometimes entered a polite and relevant comment, quoting the first sentence of the letter, into the website Times of Israel, to find that it has quickly been moderated out. My second document, Epstein’s telegram to Shertok, is both a fascinating piece of history and of great importance since it confirms that the US would not have recognized Israel if it had not defined its borders according to the UN partition lines. This one has really been well hidden. A link to it, as an unsearchable facsimile, first appeared in 2012 in a story on the website of the Israel State Archivist (Document No.3). Until now, the only other links to it on the internet have been from my own writings, and the only plain text copy of the document on the internet has been on my website. The Zionist leadership did not want to define the borders of Israel when they declared independence from the rest of Palestine on May 14, 1948, but were forced to specify borders according to the UN Partition Plan in order to achieve recognition by the USA. The territory captured by Israel outside these borders in the 1948-49 war and incorporated de facto into Israel was obtained by war in violation of the fundamental principles of the UN Charter. Since1949 Israel has attempted, very successfully, to convince the world that this border definition never happened in order to hide the fact that the captured territory is outside Israel’s declared and recognized sovereign borders and is therefore rightfully part of the territory of Palestine, within which the Palestinian people have the right of self-determination. Although the Palestinian leadership has accepted that Israel can keep this territory in a peace agreement, there is a very strong case for compensation for its loss in the form of a transfer of Israeli territory in the southern Negev to Palestinian sovereignty. Did Ben-Gurion really turn up on the morning of May 14, 1948 with a new version of the Declaration that did not mention the Partition Plan? Or was it actually he who realized overnight that the idea of creating a state with undefined borders was not going to work? The various drafts of the Declaration are said to be on display in Independence Hall in Tel Aviv. Is there an Israeli reader who could go along, take a look and let us know? How did the Zionists manage to persuade “everyone” that “Israel has never defined its borders”? It would take a major project in social psychology to answer that question fully, but it would be interesting to hear the views and experiences of readers. I will respond to all comments.